With All My Love Always. I remember like it was yesterday. I dragged my 3 year old a newly 2 year old through Harris Teeter to get some last minute balloons. For whatever reason, I thought it would be faster to skip the cart and just run in and run back out. I never factored in that I was wearing new skinny heels and would have to juggle a handful of balloons, a preschooler and a toddler in said heels. Somehow we made it back to the car and ultimately to Outback Steakhouse before my mom arrived. Once we were all there, we were seated. My mom ordered her typical rare steak (which she always joked was “still moo-ing”). I got my steak-loving gene from her, but I like mine a little less… moo. Anyway. After we finished, we pulled out gifts. I gave my mom Shrek 3 (I still don’t know why those were her favorite movies) and a framed photo of my brother, sister, and me. My brother gave her UNC basketball tickets; something they had always wanted to do together. My sister gave her a scarf and a percolator. If you’re like me and were a teen in the late 90’s or early 2000s, you’re probably thinking of that song “It’s Time for the Percolator” and the dance no one could do. Except for my friend, Mitch (hi Mitch!). A percolator is a coffee pot that is similar to a tea pot, but boils the coffee grounds inside. She swore coffee tasted better from that than anything else. It’s what she wanted, so it’s what she got. We had an Oreo cake and sang to her, and gave her one more gift from all of us- a weekend at the beach four weeks from then, with all of us there. After we finished, Mom went to go pull her car closer since the lot was full earlier. My brother followed with the gifts. I teared up when the door closed behind her. 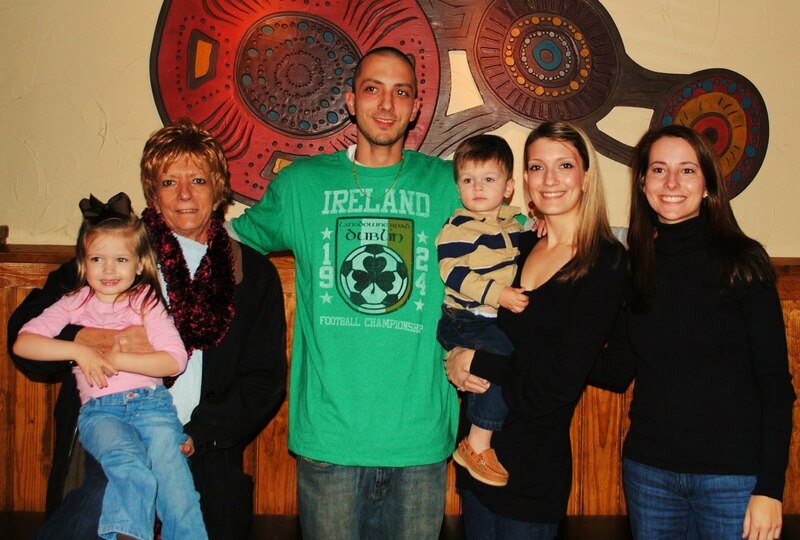 My sister came to the waiting area and was also crying- she had gone to thank the waiter for his service… Told him that our Mom had cancer and this was probably her last birthday we would spend with her, and he made it a great evening. The waiter pulled her into a hug and just let her cry. The realization that this probable last birthday was officially over hit us both hard, and we cried together for a few minutes until Mom came back in. She never saw our tears, just scooped up her grandbabies and talked excitedly about how good her coffee was going to be in the morning and that she couldn’t wait to go to the game and the beach. We asked the hostess to take a photo of us… and that was it. Three months and four days later, Jesus called her home. I miss her. I miss so much about her. You know those things that your mom does that annoy the mess out of you? I miss those, too. I miss her deep voice. The one I used to be embarrassed of in the drive-thru when they would ask, “Will that be all, sir?”. I miss how she laughed at mildly inappropriate times (now you know where I got it from). I miss knowing no matter what, she would be there. I miss being able to call her and ask what to do when one of my kids is sick. I miss telling her stories about the kids and listening to her laugh hysterically. I miss her smell. I miss her random gifts that she knew we just “had to have”. I really, really miss her cards she spent months searching for. Her familiar handwriting scrawled across the envelope, the perfect card, and her own sentiments added at the end. Sometimes even a little doodle… a balloon or whatnot. My sister gave me my early birthday gift this weekend. It couldn’t have come at a more perfect time. 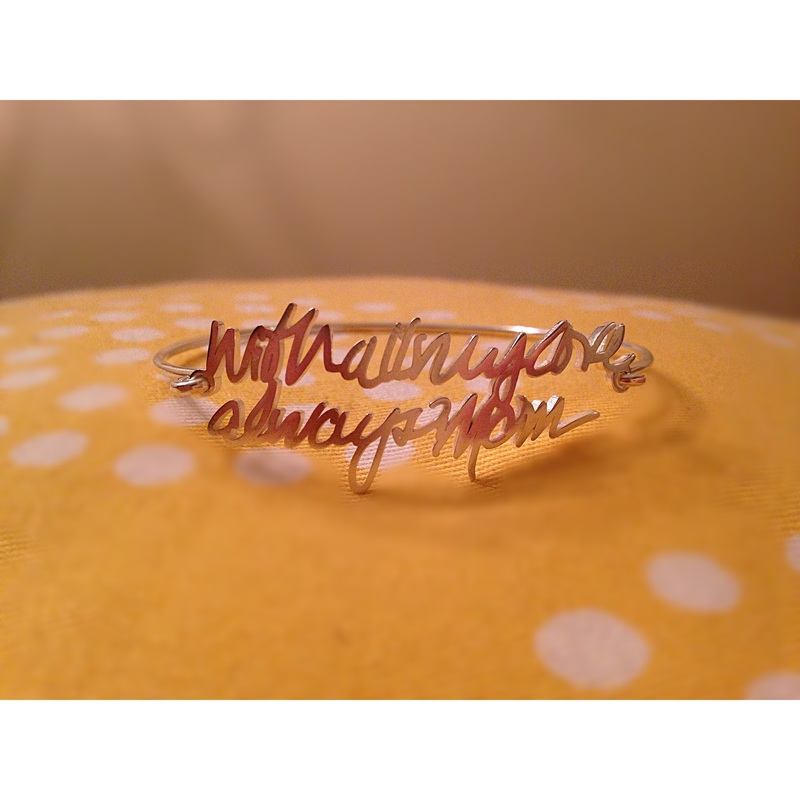 It’s my Mom’s handwritten note made into a bracelet. One of my most favorite and most missed things about my Mom, I can now adorn my wrist with and look at it every day. Something I can look at on my hardest days and remember “With all my love always, Mom”. < Previous I Can’t Believe I’m Even Writing This. You are going to have supply tissues with this sort of post. I mean really. I miss her, too. Perculated coffee does taste better, but it takes forever! Can you pm me the info on the bracelet? I want one so much.